Looking for some great ideas for snacks for your upcoming Halloween party? Look no further! I've got some of the best ideas on the internet all in one place for you. Every recipe is quick, easy, and guaranteed to delight your guests large and small. 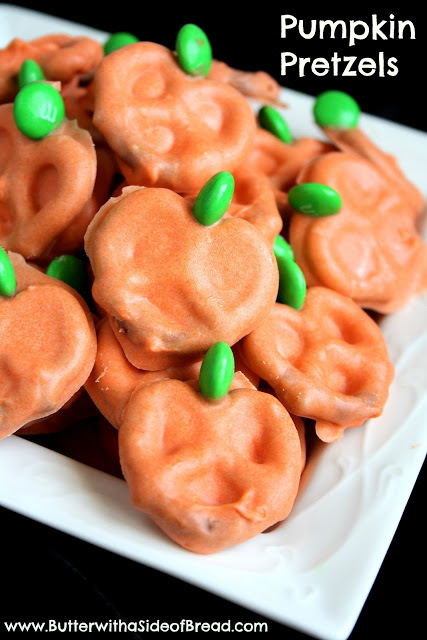 Pumpkin Pretzels- via ButterwithaSideofBread I'm a huge fan of doing dipped pretzels for the holidays with a colored chocolate. The green m&m's are a great touch for a stem! Or how about these handsome fella's? 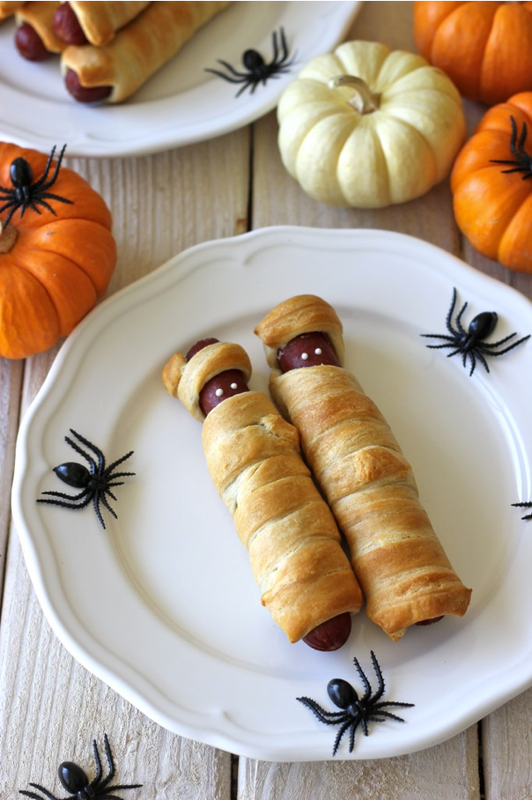 Hotdog Mummys- via Damn Delicious. 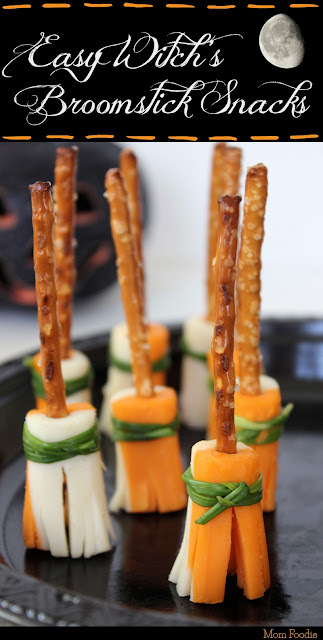 I've used the Pilsbury refrigerated dough to shape "bones" before, or sometimes will wrap a mini hotdog for appetizers, but this full size version is super adorable. I love the little faces! 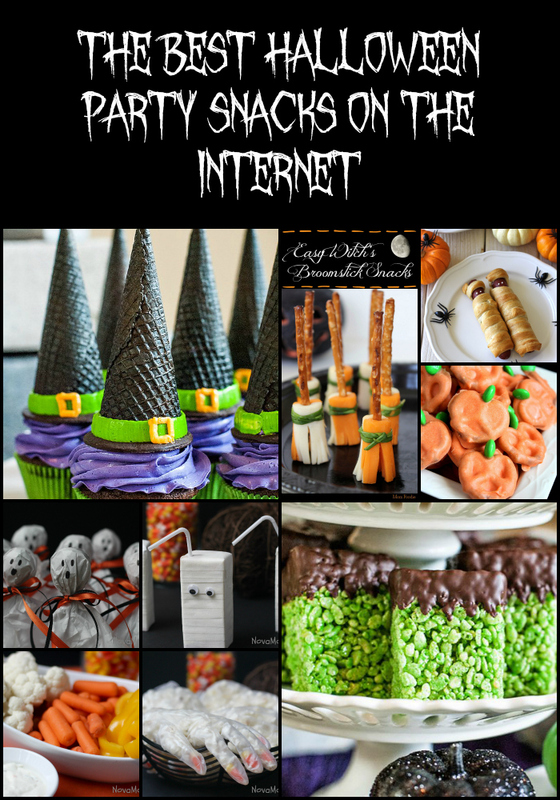 Easy Witch Broomstick Snacks- via Mom Foodie on Bloomi.com These easily have to be my favorite. And not just because I love cheese. It's only 4 steps! So easy! 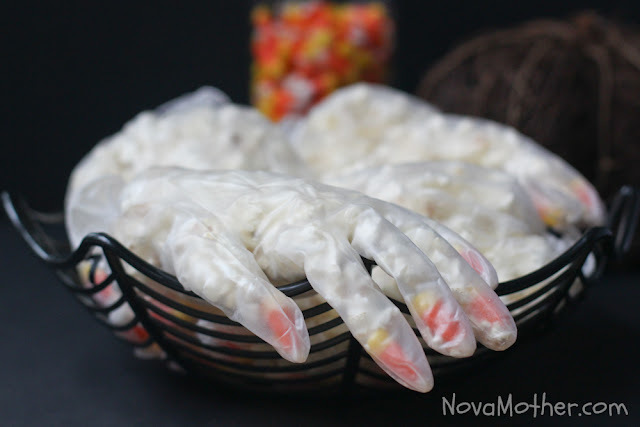 Frankenstein Rice Crispie Treats- via Hostess With The Mostest Blog Personally, I think these could use a face like candy eyes or even just piped on facial features with some frosting. 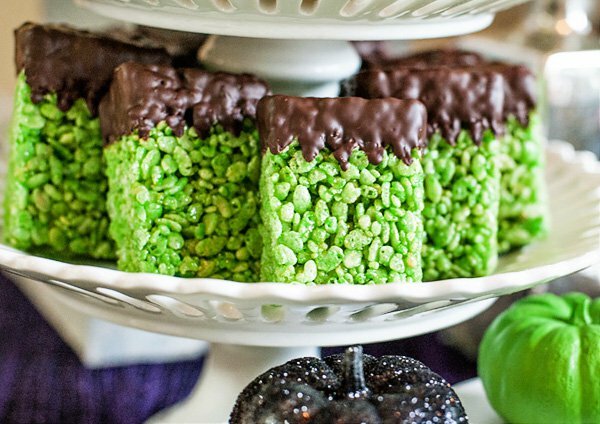 But if you're in a hurry, you could always make some four ingredient rice crispie treats- Rice Crispies, marshmallows, butter, green food coloring, and melting chocolate. Adorable and delicious! 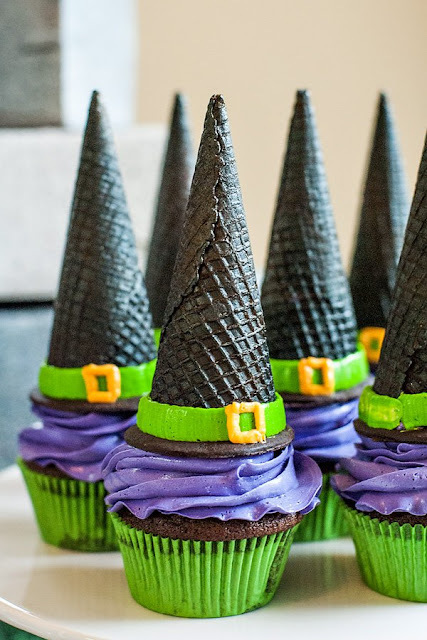 Also from this same blog post, they featured these gorgeous witch hat cupcakes. Unfortunately, the blog is an inspiration styled shoot to give you ideas for decorating and no actual how-to's. The cupcakes were made by a bakery, but I think with a little ingenuity you could whip up some on your own. The tricky part would be to make black waffle cones. Here's a recipe for homemade waffle cone batter and a waffle plate for the cones. Black food coloring could probably get you a nice deep black or at the very least grey cone if you want to put the work into it. Pipe on the accents for the hat band and buckle, and it's just color frosting from there! 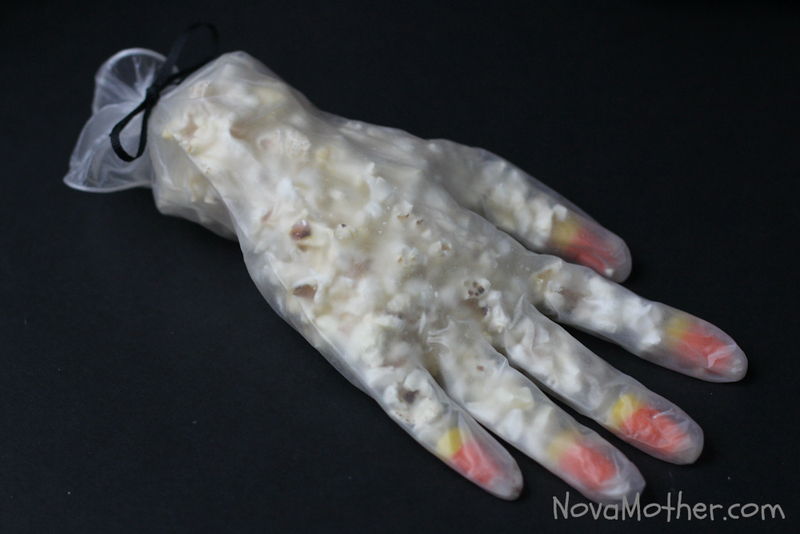 Popcorn Hands- Simply pop up some popcorn, drop a candy corn into each fingertip of the glove, fill, and tie with ribbon. Add a Halloween ring for some pizzaz! 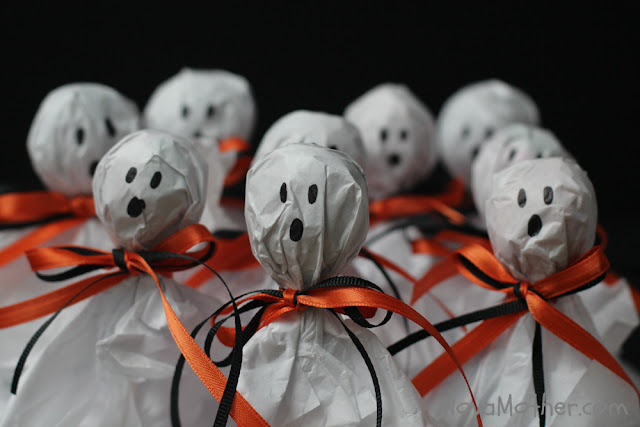 Ghost Lollipops- All you need for this quick decoration is some lollipops (I prefer Tootsie Pops since they have the perfect round shape), white tissue paper, and orange and black thin ribbon. Cover with tissue paper, tie with string, done! You could also substitute tissue paper for actual tissues in a pinch. They are the perfect size already and give a smoother look to the face. Just be careful when drawing on the face, as the permanent maker can bleed on the tissue. 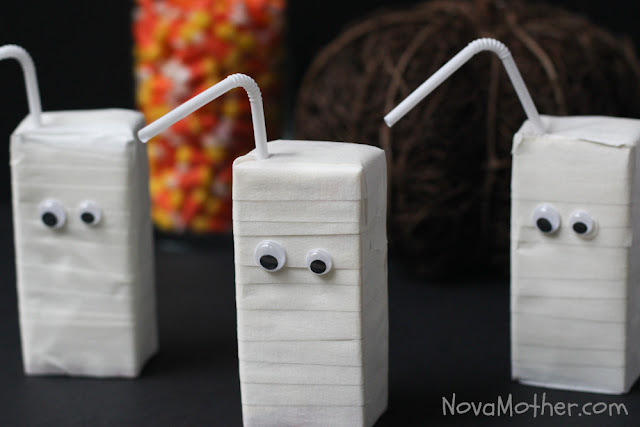 Mummy Juice Boxes- Wrap with white tape. Glue eyes. Ta-da! And they look so cool. I highly recommend using white duct tape. Here I used white masking tape, and the second they got a little wet (poking the hole for the straw is no joke) the tape started peeling up like crazy. Candy Corn Veggie Tray- Believe me I searched everywhere for a plate in the shape of a candy corn, but there were none anywhere in the stores. Not Walmart. Not Target. Not the Dollar Store, Micheal's Crafts, or Christmas Tree Shops. Nowhere. So I put them in candy corn color order in a long bowl and called it a day. Whatever works! Thanks so much for reading! 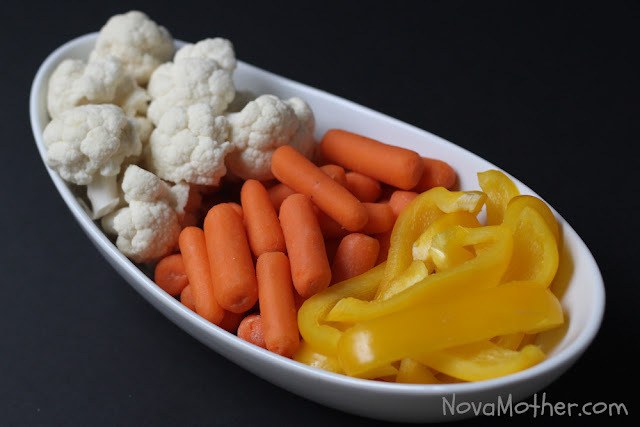 Don't forget to PIN this article for future reference and of course check out more of my delicious recipes and crafts on the blog. See you next time!